Welcome to Ogden Station Daylilies located in Ogden Station, Lenawee County, Michigan, centrally positioned between Adrian, Michigan and Toledo, Ohio. When the railroad was built in the 1870's, Ogden Station became a booming community with a ticket office, pharmacy, post office, general store, and bank, all located in our renovated Centennial Farm homestead. Ogden Station grew to include a church and a cooperative grain elevator, which still stands beside our daylily farm. Our daylily business started in 2007 when we visited Fred Sheill of AuGres, Michigan, who at 100 years young still managed a 10-acre daylily farm, earning him the title of "Daylily King." Fred persuaded us to buy 400 seedlings, and since then we have added nearly 800 registered varieties, which include miniatures, spiders, unusual forms, and doubles. We've been concentrating on building a collection of rebloomers. 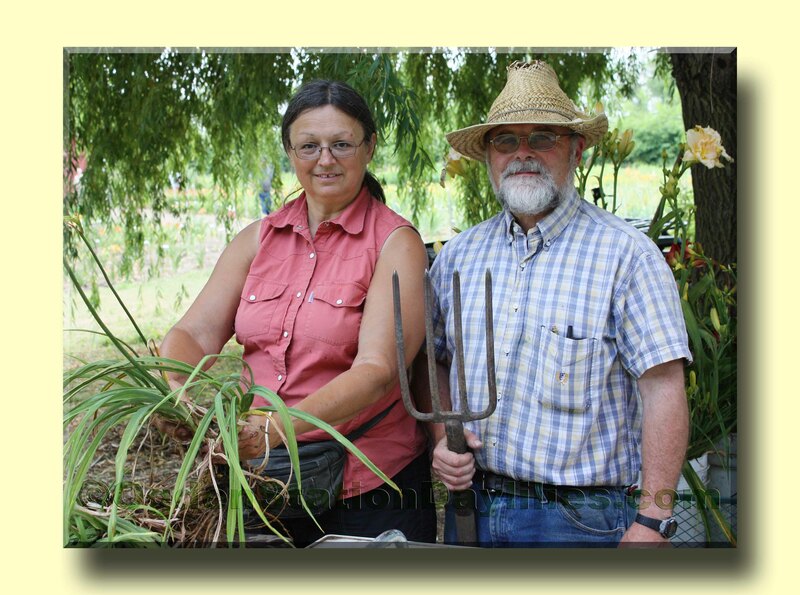 During the summer of 2008 we started selling plants at the farmers' market in Adrian, Michigan, as well as selling at activities of two organizations that we attend, the Southern Michigan Daylily Society and the Black Swamp Hosta and Daylily Society found on Facebook. It's been a lot of work, but so much fun. We've met so many interesting gardeners and hybridizers who have shared their expertise with us. This is a family hobby business for us, along with other hobbies such as genealogy, quilting, crafts, and photography for Lisa and bird watching and enhancing wildlife habitat through conservation practices on the farm for Jerry. We're still learning about daylilies too, and would be glad to share our experiences and knowledge with others. 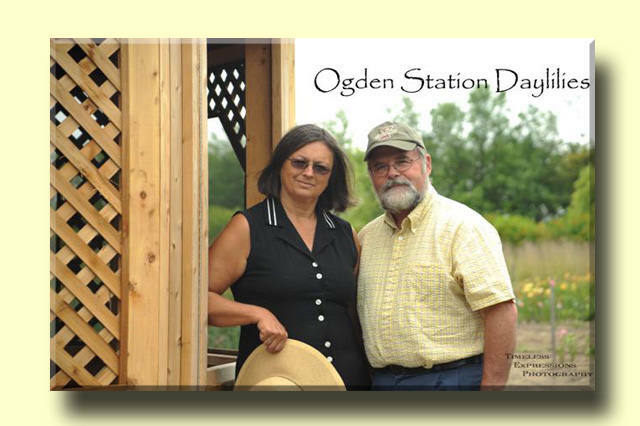 If you'd like to read more about raising daylilies, click on Daylily Information, and if you'd like to know more about Ogden Station and our farm, click on Ogden Station Images. This is what we really look like most of the time! We have often been asked what are our ten favorite daylilies. That's impossible to narrow it down to ten, but here are some of our favorites.